You’re going to hear a lot of “I love downtown” from St. Joseph residents and guests. Downtown is coming alive block by block, with awesome surprises at every turn. Recent community initiatives, businesses and events are lighting up this historic area. 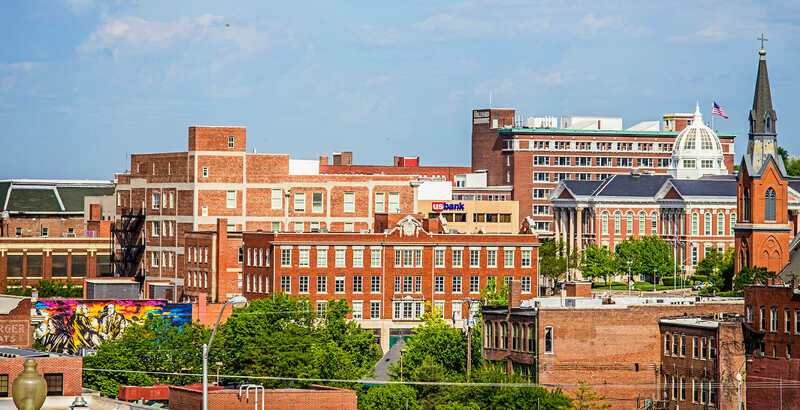 There are new streetscapes, new artworks, new shops and restaurants… and all are celebrating the late 1800s and early 1900s architecture that remains a hallmark of our city. First Saturdays are bringing an “open door” atmosphere all year long with boutiques, cafés and shops featuring welcoming displays. In the fall and colder months, pop in to the shops for cozy samples and conversation. First Saturdays in Downtown St. Joseph have something to intrigue and inspire you across every month of the calendar. First Saturdays Downtown are definitely a celebration, but the options for families, couples or just some recharging on your own can be found at any corner. Nestle up to a window table for crafted beverages, coffee, or an innovative lunch or dinner – you’ll have a view of this energy where old meets new from a list of local favorites. The view is even more electric in December, when storefronts are decorated with holiday magic and sparkling electric snowflakes make for great photos across the heart of the Downtown area. 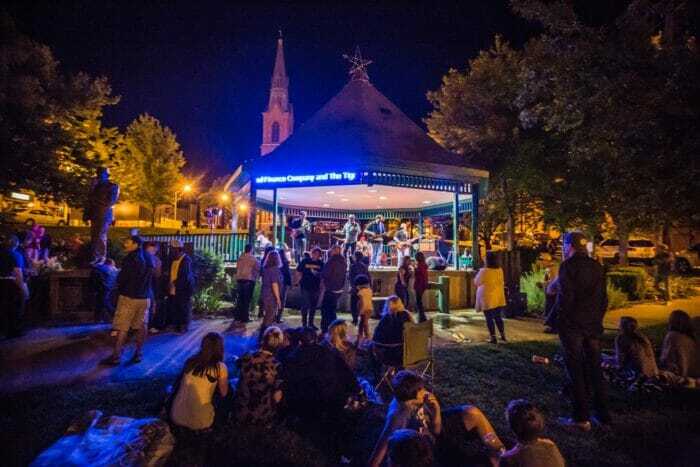 On nearly any given summer weekend, the sounds of awesome local talent – from jazz to rock to bluegrass – are filling the night at Felix Street Square. Dedicated to St. Joseph-born jazz great Coleman Hawkins, a bronze statue of the man himself on his saxophone stands watch at the park with an expression that captures this unfolding musical story. Local food trucks are surrounded by twinkling apartment lights. Rooftop views from places like Felix Street Gourmet – and the surrounding architectural spires accenting the skyline – make the sunset one to remember. Shops on Fridays near the Sounds of Summer concert series are open a little later, like Brioche French Café and Bakery with comfortable patio seating. A newly renovated refreshment pavilion (with shade and lovely modern bathrooms) means lingering a while and kicking back on your blanket is a requirement. Did we mention you can also catch the Imagine Eleven concert series on Sunday nights to round out your weekend? 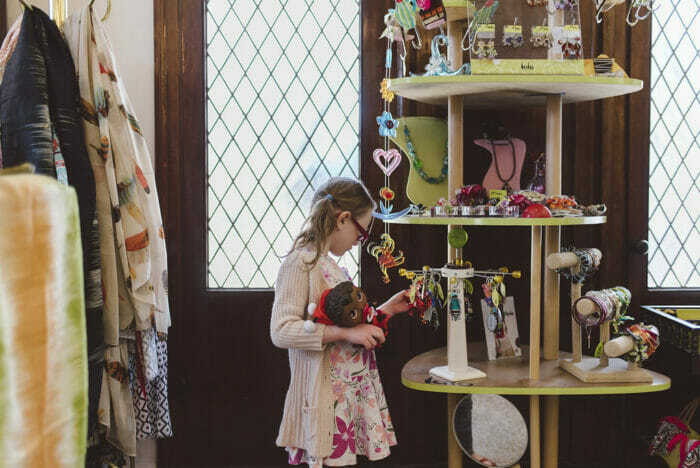 Mod Podge Boutique and Design Studio:This locally-owned store constantly reflects the inspiration of its owner, who is a true professional in the design and fashion industry. You’ll find unique clothing from t-shirts to dresses, plus jewelry, shoes and gifts in a beautiful historic building. Manic Snail: Go on and write your story here. Manic Snail is a paper and gift boutique with much-talked-about and memorable items. Get ready to smile, explore and enjoy. Nesting Goods: Handmade. Rustic. Warm. Inviting. You’ll find everything for your home or as a gift at Nesting Goods. Nearly all the items are upcycled and hand-crafted – so expect some delightful surprises and a variety of materials. (Note: Geneo’s locally owned pizza, calzones and salads is just a door away). CBD American Shaman: Located in an 1880s bank, the architecture inside this boutique is as equally inspiring as the items. Explore essential oils, candles, pain relief items, soaps, jewelry and more alongside original fireplaces and the vault. (Ask about the Jesse James and Paper Moon connection). Lucky Tiger: Unique, well-priced and laidback vintage awaits. Find t-shirts, denim, dresses, shoes, jewelry, records and more. It’s all quirky, all vintage and all fun. Hunterland Antique Mall: Spend some time browsing here at numerous booths, including straight-up antiques and creative décor. Felix Street Gourmet: Global wine and cheese, cured meats, upscale snacks and more with a friendly and knowledgeable staff. Pick up everything for a fabulous picnic! Eat: Fresh, local, cozy and eclectic. It’s all here. Brioche Café: French-inspired daily lunches, breakfasts, fresh crepes, cakes and sweets – all in a gorgeous building that feeds the imagination, too. (Yes, the owner is really from France!) Grab a cozy window seat or enjoy the outdoor patio. Boudreaux’s Louisiana Seafood & Steaks: This authentic Creole and Cajun establishment has it all, inside a wonderfully restored late 1800s warehouse building. Seafood, chicken, gumbo, steaks, salads and a full bar. Locals love the homemade onion rings and Cajun gravy. Jake’s Steakhouse and Sports Bar: Check out the nostalgic St. Jo décor and the barbecue, burgers, steaks and more – along with one of the largest outdoor seating areas downtown. Ground Round: A long-time favorite, the Ground Round has expansive seating and a full menu, including several choices for kids. Gather here and linger, and there’s an open door to late-night happy hour. Just Desserts by Bracy’s Café: Home cooking awaits, plus several choices for pies and baked goods. Breakfast and lunches all made from scratch. Bad Art Bistro: Chef-driven dinner menu and a fantastic walled courtyard are just the start. Sunday brunch will keep you thinking about it all week long. Evening specials range from upscale small plates to gourmet burgers. Great for a casual evening or a table for two in an eclectic yet cozy space. Longboards Wraps and Bowls: A sunny, Hawaiian inspired choice for fresh wraps, bowls and even breakfast. Geneo’s Pizza & Pub: This is a spacious and family-friendly gem of Downtown. Historic floors and décor meet homemade pizza, calzones, pasta, salads and more – plus arcade games and an inviting bar area. Friedrichs Market: Located in the up-and-coming east side of Downtown, along Frederick Avenue, this urban market has fresh baked bread, local meats, fresh produce and so much more. Gold-N-Glaze Donuts: On the edge of Downtown and historic Frederick Avenue, Gold-N-Glaze offers donuts made from a nearly 80-year old tradition. Check out the rustic renovations and historic St. Jo artifacts, too. 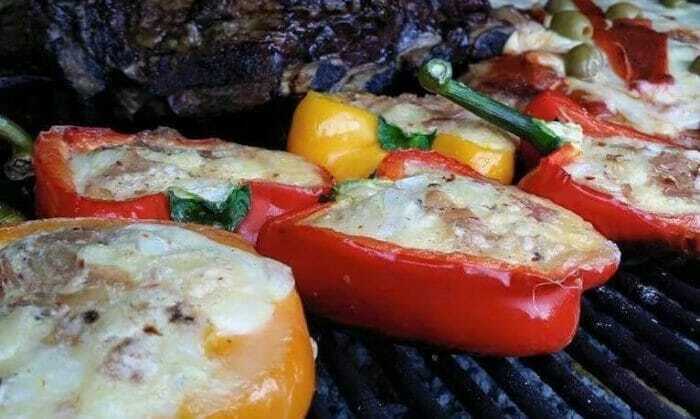 Belle Epoque Café: New to the St. Joseph culinary scene, Belle Epoque Café is a great place for friends or a date night with a farm-to-table menu. Think old world Europe meets neighborhood eatery. 1785 Miles: That’s how far it is from St. Jo to the chef’s homeland of Cuba. Enjoy Cuban cuisine from family recipes and…shh…there’s a genuine speakeasy downstairs in this historic and elegant bank building. Il Lazzarone: The hand-made pizza oven is the real deal, imported from the mountain area of Italy. (Kids will enjoy watching the chefs flip the dough.) The pizza and the atmosphere are about as authentic as it gets – and both pairs well with the outdoor patio and local brews. Check out the dessert pizzas, too. Fredrick Inn: Just across the street from Il Lazzarone is the Fredrick Inn, open for over 30 years. The Beef Backer Hall of Fame Award gives this St. Joseph institution bragging rights as the finest steakhouse in town, specializing in prime rib and custom cut steaks. Must try…the spinach salad. 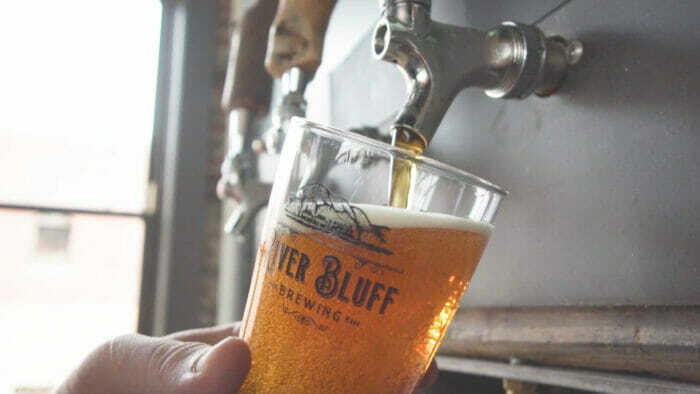 River Bluff Brewery: It’s spacious, historic, inviting and offers so many locally made beers to choose from. The friendly ambiance and St. Jo memorabilia make this restored warehouse building a welcoming and family-friendly stop. Tiger’s Den: Open daytime and evening hours, explore shelves of gently-used books on a comfy couch along with a literature inspired cocktail list and a big selection of micro brewed beers. 503 Winery: Featuring Missouri-made wines, this restored Downtown space is inviting for all levels of wine connoisseurs. Travel the wineries of the state all in one stop. Gallery on 6th: This coffee shop and café offers homemade lunch and treats, plus carefully brewed coffees in an artistic and rustic atmosphere. Mokaska Coffee Company: This locally owned, small batch coffee roastery offers generous mugs of crafted beverages along with regional beers and ciders. Ask about the name and its historic roots. Café Pony Espresso: This quaint coffee shop offers laid-back ambiance plus an art gallery and some fascinating St. Jo artifacts to browse. For lunch, there’s homemade soups, veggie burgers and guacamole, for starters. Magoon’s Famous Delicatessen: How to describe? Try live music and tons of St. Jo antiques nearly seven nights a week. Stop for lunch at this St. Jo local legend or kick back in a vinyl booth with members of our famed local music scene during popular evening hours. Be Inspired: Get a change of perspective in Downtown St. Jo. The Yoga Room: Peaceful and inviting, drop in for a class with experienced and welcoming instructors. 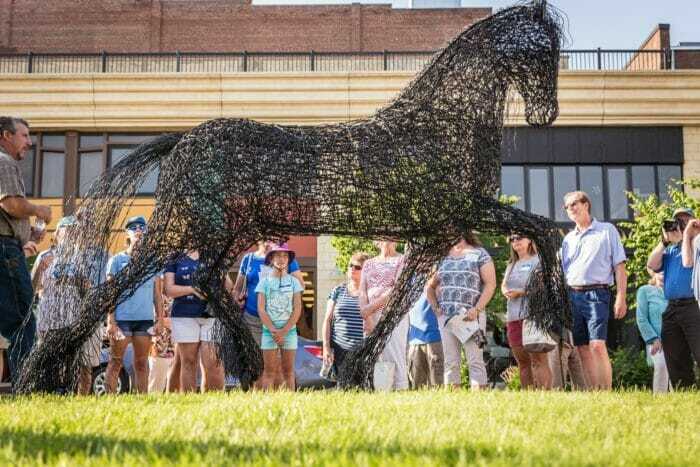 Downtown Sculpture and Art Walk: This is a year-round, juried collection of outdoor sculptures that’s perfect for family photo opportunities. Performance Arts: Professional musicals, comedies and theater come to Downtown St. Jo year-round, with many shows set in the remarkable 1920s art-deco Missouri Theater. It has one of the only remaining suspended ceilings in the country – and the local theater produced in St. Jo has earned accolades and awards across the Midwest. (Check out the Allied Arts Council, Performing Arts Association and Robidoux Resident Theater for upcoming shows). Don’t miss the exciting and memorable dinner theater experience at Ruby Theater, inside a recently renovated historic building. St. Joseph Downtown Public Library: With a stained-glass dome, a glass mezzanine floor and many restored turn-of-the-century features, this awesome architectural space is both adventurous and relaxing as a family- friendly stop. The dedicated Downtown Children’s Library on the lower level is full of imagination. Check out the train table, “grocery store” play area and costume area. Stay: Wake up to a new view in one of our majestic Bed & Breakfasts. 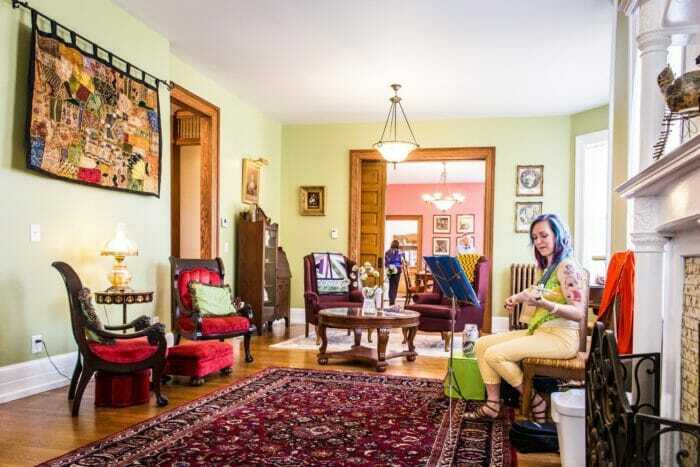 Whiskey Mansion Bed and Breakfast: Built in 1885 by German immigrants, this carefully restored mansion has so many details to take in. The original family produced several whiskey brands in the late 1800s and the home showcases their success. Chef-quality meals and welcoming innkeepers greet you here. Shakespeare Chateau Inn & Gardens: Known across the Midwest for remarkable architecture, this elegant mansion is the gem of historic Hall Street (a.k.a. Millionaires’ Row, circa 1885). Ornate woodwork, stained glass, and so many rare and fascinating elements will fill up your senses. The Vineyard Mansion & Carriage House Bed and Breakfast: Located at Museum Hill, a National Register of Historic Places neighborhood, you’ll find four suites in the Mansion plus a unique and cozy offering in the Carriage House…all while enjoying your own key and several main floor spaces, plus a self-serve breakfast. The Charles: This recently restored Colonial home is located in Museum Hill Historic District and offers comfortable décor across the suites, plus access to shared spaces. You’ll have full use of the kitchen if you choose to prepare a meal, and The Charles offers a continental breakfast. It seems every month there is something new popping up in our downtown area, and we can’t possibly list everything there is to see and do now, so make sure you check out StJoMo.com for complete information.